You may have seen references in Facebook groups to people “looping” and wondered what it is. It may have been dropped into a conversation on Twitter or Instagram. You might have seen the term on a forum somewhere. And you might not have understood what the term meant. As the above definition says, it’s using an automated insulin delivery system to maintain optimal glucose level. But, I hear you crying out, isn’t the only one of those available on the market available from Medtronic? And you’re in the UK, where it isn’t available yet? So what DO you mean? The term “looping” derives from “closed loop delivery”, which is a term used to describe artificial pancreas technologies that react to glucose data received from a Continuous Glucose Monitoring system, predict what is likely to happen and deliver (or suspend) insulin from a pump in response to the data they have, and maintain control of glucose levels, in many ways mimicking what the functioning human pancreas does. For a more detailed description of these terms, the introduction of this paper is reasonably readable. Whilst I continue to describe them as “closed loop”, it’s worth pointing out that with current technologies, a better description is “Hybrid Closed Loop”, as for most people, interaction with the system is required around meals. In some cases, with the use of Fiasp, that can simply be telling the system a rough estimate of the amount of carbs in the meal, and letting it handle everything else. As Dana Lewis has mentioned on multiple occasions, she hasn’t bolused directly in 6 months. More specifically, “looping” is used by the community that have got fed up of waiting for commercial companies to produce a product of this type and have self-built DIY “Artificial Pancreas”, or “Closed Loop” systems. Bloomberg has produced a great article that goes into a great deal of detail about the history and origins of the movement, and where WeAreNotWaiting came from, “The $250 biohack that’s revolutionising life with diabetes“, so rather than go into the detail, I’ll let you read it there. Instead, if you want to see the evolution of the system from the beginnings that Ben West put in place, there’s the graphic below. What’s available in the UK? OpenAPS is the “grandfather” of the DIY Closed Loop, having been the first implementation of anything like this in the wild. Loop runs a different algorithm, and runs on iOS while AndroidAPS is an implementation of the OpenAPS algorithm running on Android, with its own customizations. The key question is generally, “What pump is available to you?”, and beyond that, whether an in warranty pump is important to you. 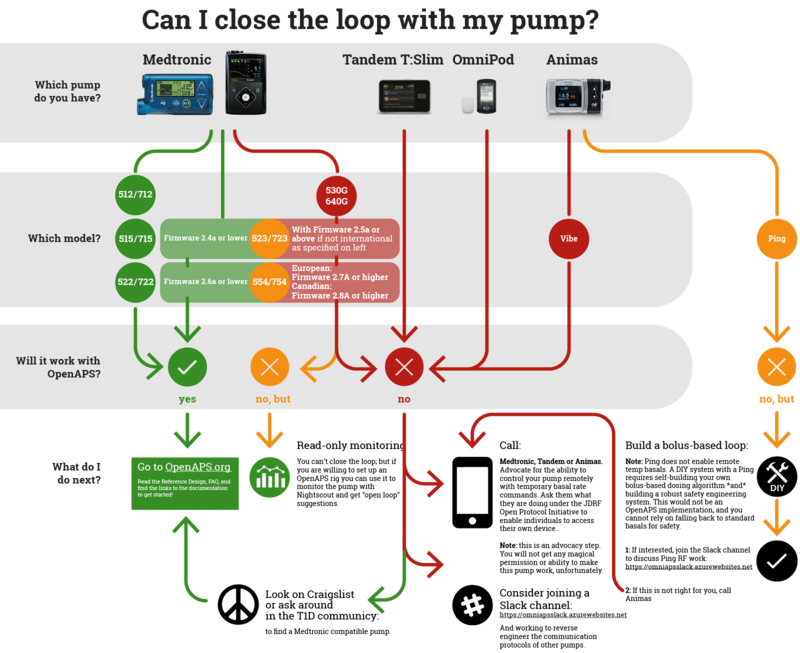 If you are already on a Medtronic pump, or you want to use Loop or OpenAPS specifically, you’ll need to ask around and try to find a loopable pump. The image below should help with what is loopable. Finding one entails scouring the web and asking clinics and other people that pump if they have old pumps available. It’s worth being aware that loopable Medtronic pumps seem to be harder to source in Europe than in the US due to differing product lifecycles and the lower proportion of people pumping in Europe, however, there have been posts in Facebook groups suggesting that loopable Medtronic pumps can still be bought new from Lithuania (all be it at a fairly high cost). You can also use AndroidAPS in open loop mode with non-loopable pumps, but you lose the benefits of a closed loop. Many people who run open loop do see improvements in their indicators. At the last count, there are more than 800 recorded users of DIY closed loop systems and it’s estimated that there is a far higher number of users (more than 2,000), accounting for more than 5.9 million loop hours in the real world, not in clinical trials or lab tests. The options are all incredible and allow DIY closed loop users to experience fewer highs, less severe lows, and more “time in range”: most users self-report less of both highs and lows, plus more time in range, AND hbA1c reductions – not to mention the quality of life improvements associated with having a system that can auto-adjust basal rates overnight while they sleep. And of course, these systems are producing vast amounts of data that has never been available before about living with diabetes. A number of users contribute this data anonymously to OpenHumans.org, where it can be used by researchers to derive insights that otherwise we couldn’t get. There are a number of research studies going on with this data as we speak. You can read more about the reported outcomes and research over at openaps.org. If this has piqued your interest, you can find out more here. And pop over to the Facebook groups dedicated to DIY closed looping, Looped and Looped UK. It’s fair to say that, for those who have chosen this path, it has changed our lives, and I don’t think any of us would choose to go back to what we had before.